It's winter, which means it's almost time to battle the giant snow pile at the end of your driveway. You know what I'm talking about; the frozen mountain created by a city plow just before you're about to leave home. Get the right tool to handle winter's worst. The speed and performance of a three-stage snow blower will save you time and energy and make clearing large drifts a breeze. 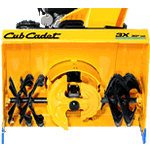 Below are a few ways in which a three-stage snow blower enhances your snow-clearing efforts. Two heavy duty steel augers collect and move snow to the center where the induction accelerator chops and pushes the snow directly into the high-performance impeller, launching it up to 50 feet away. Throughput describes how much snow can be moved through the blower at a time. 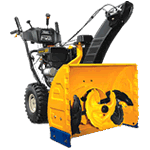 A three-stage snow blower moves up to fifty percent more snow than a two-stage snow blower. This means higher efficiency and less snow left behind. The increased throughput of a three-stage means it can handle more snow at once. Most snow blowers have to take large drifts a little at a time. A three-stage has the power and efficiency to handle it with speed. Because of its enhanced performance and innovative design, a three-stage snow blower leaves less snow behind. It keeps more snow moving all the way to the impeller, which means a cleaner driveway and cleaner augers when you're through. Track-drive snow blowers move how a tank does across the snow; the tracks remain in contact with the ground on steep terrain, giving it maximum traction in harsh environments. Unlike snowblowers with wheels, track-driven blowers are safe to use on steep paved or unpaved surfaces and are available on two or three-stage snow blowers. 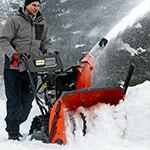 Three-Stage Snow Blower Buying Guide - Find Out How to Pick the Perfect 3-Stage Snow Blower. Our snowblower how-to library can help you pick the perfect single-stage snowblower, two-stage snowblower or snow blower accessory.